Mixer Arm Polyurethane Guards – Wear Resistant! Mixer Arm Polyurethane Guards are always manufactured from highly durable polyurethane formulations that hold up to the toughest environments. 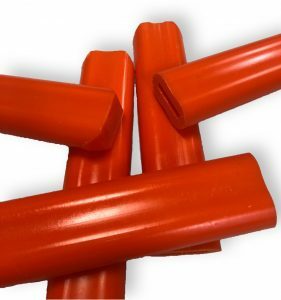 Along with other high-quality urethane products, we have been in the business of producing Mixer Arm Polyurethane Guards that are of an unbeatable standard over the past three decades. To ensure that the quality of our mixer arm rubber guards never falls below world-class standards, we always make use of raw materials that represent the best quality available on the market. This measure has made our brand the go-to company where the demands for mixer arm polyurethane guards are not only met quantitatively but also qualitatively and in record timing. It doesn’t matter what industry or application you’re seeking mixer arm poly guards for; we have them available at Plan Tech in different shapes, sizes, and hardness. Also, our team of engineers who rank among the best in the industry can work with your idea or sketch to custom-make Mixer Arm Guards that will meet the exact requirements of your demand. Our mixer arm rubber guards will offer tremendous value for your money with their exceptional ability to resist wear, corrosion, abrasion, and chemicals. When it comes to mixer arm rubber guards our design expertise, quality control, and unparalleled customer service are the secrets to our success in the industry. Plan Tech also has an outstanding team of dedicated employees with exceptional talents designing and manufacturing urethane molded parts. We also are very proud of the “company we keep.” Our customers include many Fortune 500 companies, most of whom have been customers for 20+ years. Their drive to become industry leaders has helped us do the same. A particular strength is the breadth of our in-house capabilities such as urethane compression molding and grinding urethane parts which, when combined with our extensive experience, enables us to deliver tight tolerance custom urethane parts while maintaining the quality control and cost effectiveness our customers require. Are you interested in mixer arm cast polyurethane guards? Please Contact us so we can help solve your requirements and work with you on your specific application!